The page with photos of the Archives building development has been updated. Scroll down the page to see the latest photos showing the north side of the building being framed as at 31/5/2013. Thanks to the help of Thamesite David, we have solved the location of the shop in a previous posting. We had a photo of Miss Amelia Beatrice (Beattie) James outside the Thames Fisheries Shop. The location was not clear, but thanks to a relook it is possible to see a house reflected in the glass which matches exactly with the house that used to be on the corner of Walter and Pollen Streets...south of Donkin's Garage. The reason for the shop not being identifiable today, is answered in the photo collection by B Murch. Photo 125 below show the Holiday shop and the doorway for the Majestic Restaurant...the buildings having been rebuilt following a fire. 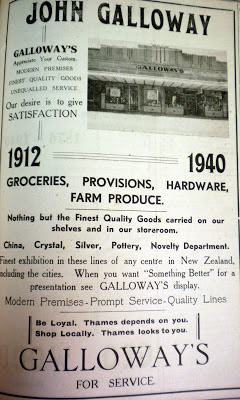 By the mid-1890s, Waihi had a sufficiently settled population to encourage Messrs Galbraith and Vercker-Bindon to start a bi-weekly, the Waihi Miner and Hauraki Goldfields Gazette. The Waihi Chronicle, part-owned by William Wallnutt, later long-time Waihi mayor, sharebroker and contributor to other papers, became a daily competitor in 1900, forcing the Waihi Miner to follow suit. The unprofitable impasse was soon to be resolved. Using key words such as "LATEST THAMES NEWS" brings us over 300 reports of the news from Thames. Remember many of your Thames ancestors may also have spent time at Waihi working in the mines. The text is not perfect in the example below, but seemed apt as we moan about the cold...in 1904 they were doing the same as the thermometer dropped to 4 degrees below freezing point!! In the 1980s the catchphrase of 'BUY NEW ZEALAND MADE' often was heard and till this day. BUY THAMES is a phrase I first saw in the 1870s as Thamesites struggled to find an economic solution outside the goldfields. In 1940 with the war in Europe, this was again heard here in Thames. 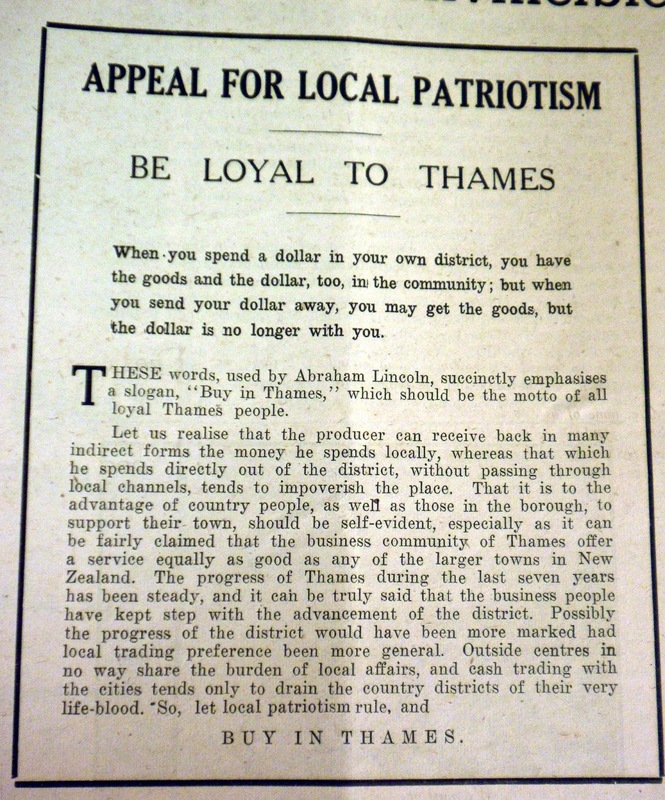 As the Thames Star Newspaper in July of that year ran a special supplement on the history of Thames and the way forward. 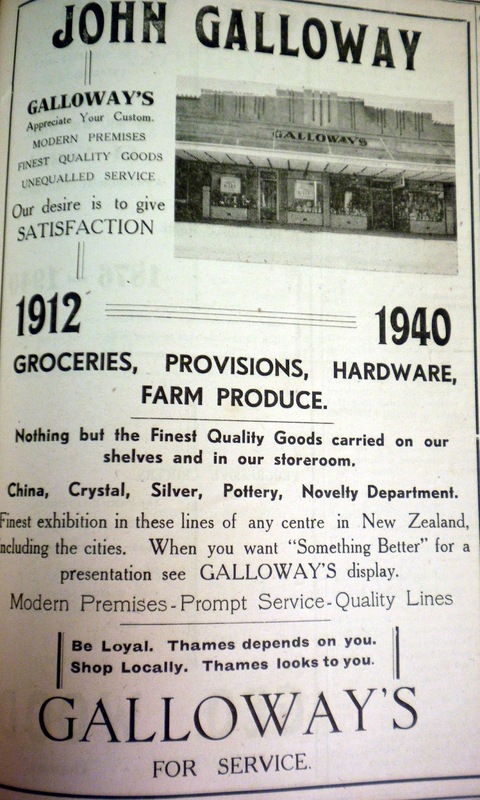 One of the Advertisers was JOHN GALLOWAY, Shopkeeper, showing his support and loyalty for the town. Little did he know, that two years later, two of his boys would die while serving their country in World War Two. 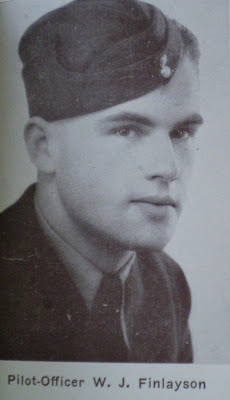 Jack (John) GALLOWAY died 26/07/1942 at El Alamein and Don (Donald) GALLOWAY died 23/09/1942 in Italy. The stories behind the names of the Thames High School old boys that served in World War Two, show a group of achievers - who performed above average academically and in the sporting arena. Men who then went onto to serve their country and Britain and paid the ultimate price. 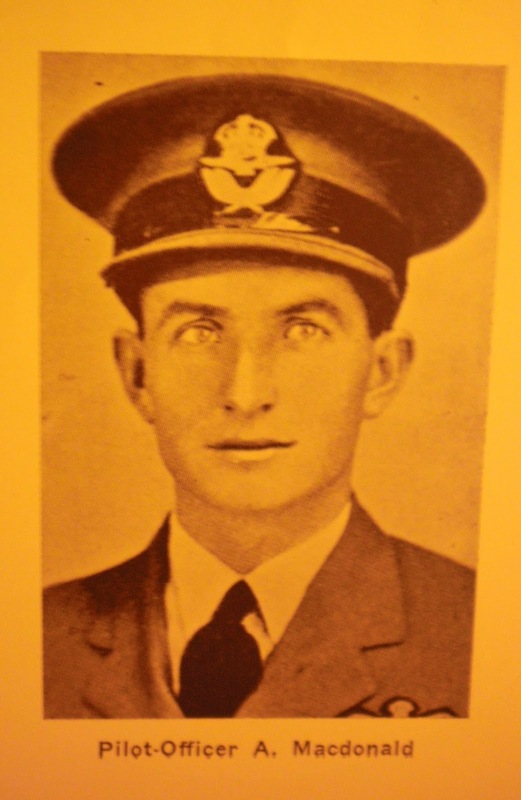 For two of these men, their friendship continued beyond Thames and the confines of Thames High School, to a bomber in the NZ 75th Bomber Squadron. Pilot Rex Martyn SANDERSON and his Co-Pilot William John (Jock) FINLAYSON were on the 24th October 1940 returning to England after operations over Norway, when the plane was forced down into the North Sea after engine failure. They were just 15 minutes from land. 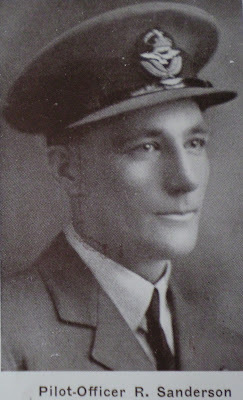 Rex was the son of Alexander and Adelaide Sanderson and attended Thames South, Kauaeranga School and Thames High School 1930-33. Jock's parents were John and Hilda Finlayson and he had attended Thames High School 1930-32. Yesterday was officially the International Nurses Days 12th May 2013. Today (13/5/2013) Thames Hospital will recognise the day with displays and other activities. Thames Hospital has been established since 1868 and had a proud association for many years as a training school for nurses. Nurse graduates have gone onto work in New Zealand and around the world. 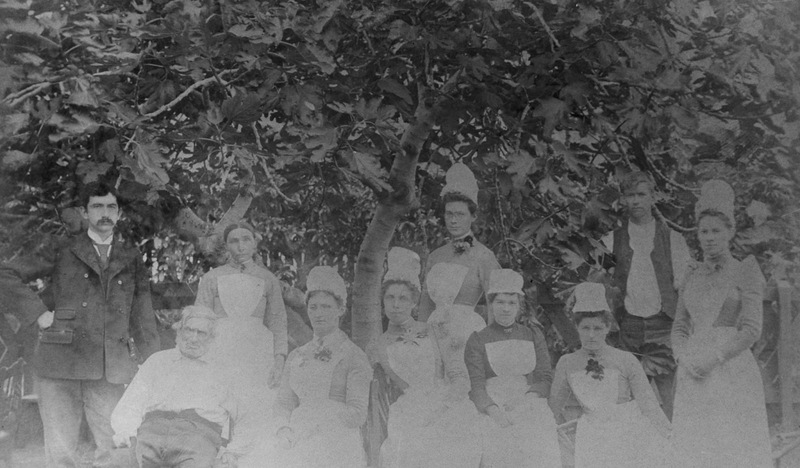 A booklet on the Nurses of Thames is available at The Treasury, Thames, New Zealand. 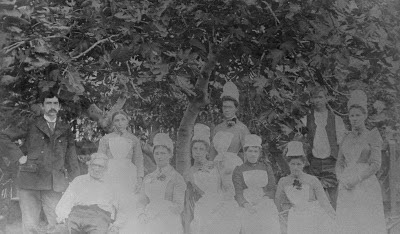 NURSES OF THAMES: A History of Registered Nurse Training at the Thames Hospital. At 11.30am today several of the walls were already erected, and the others were waiting on a nearby truck. There was lots of excitement down at The Treasury today, along with several photographers all keen to capture the big day. Tomorrow will see the building really take shape - with the walls going up!!! Many Thamesites moved to Waihi when the goldfields were struggling...as they searched for work, survival and still hopeful of finding the riches of gold. Many of you will have a tie then to these and other townships around the Thames, Coromandel, Ohinemuri and Hauraki region. The Ohinemuri Journal has a wealth of information on topics and people of the wider Ohinemuri area. The Waihi Museum has online and onsite resources. 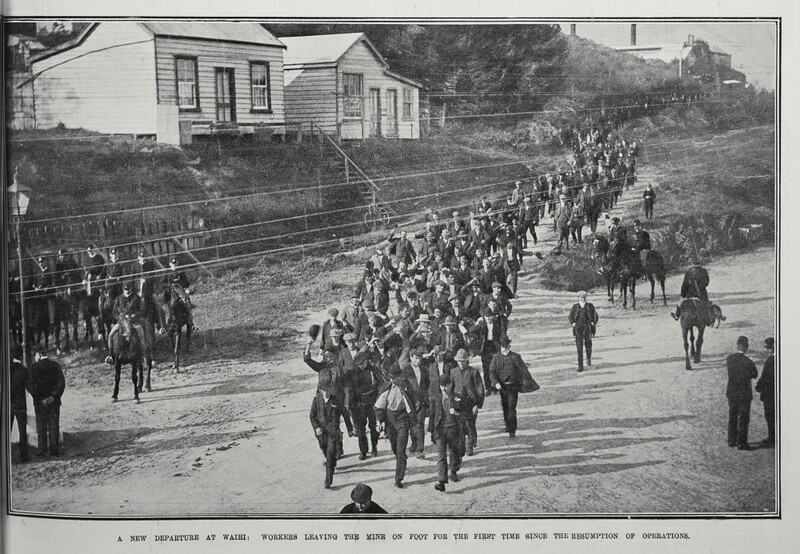 A NEW DEPARTURE AT WAIHI: WORKERS LEAVING THE MINE ON FOOT FOR THE FIRST TIME SINCE THE RESUMPTION OF OPERATIONS. Last year, we all remembered the Waihi Strike of 1912 - this year 2013 will be remembered in history by many as another black day in history. The news today that mining can be extended under the town. They say people never learn from history. Let us not forget the collapses around the town, such as in 2001. My ancestors and relations lived on Barry Road and surrounding areas - we remember the effects of underground mining! In 1953, the Thames Star newspaper ran columns asking for names of old Thames High School pupils who had served in World War Two 1939-1945. This was a similar process to how the names were gathered for the WWI memorial - and in the latter case this sadly led to many names being omitted. Names were gathered and a plaque was made, which hangs in the hallway by the Front Office at Thames High School, Sealey Street, Thames. On 24/8/1954, the Thames Star reported that the WWII plaque was under construction and would be similar in design to the WWI plaque already displayed at the school. The names of the men who died overseas (in battle or as a result of illness/wounds) were displayed in the centre section of the plaque - headed PRO-PATRIA (For the fatherland). The names of the ex-pupils who died during WWII are listed here - with links to the Auckland Museum Cenotaph Database. Many more men from the Thames-Coromandel area died during World War Two and a new project at The Treasury will collect information on these men. As with all these projects contributions from researchers are always welcomed and appreciated. 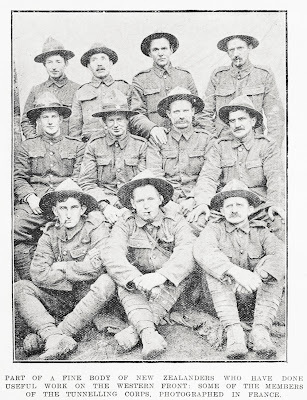 An update from the first post, still hopeful of finding new information and names of WWI soldiers who were with the New Zealand Engineers Tunnelling Company on the Western Front during World War One. The list of names is growing, and thanks to everyone involved who has helped with information and the 'helpers' around the country who have gone and taken grave site photos. 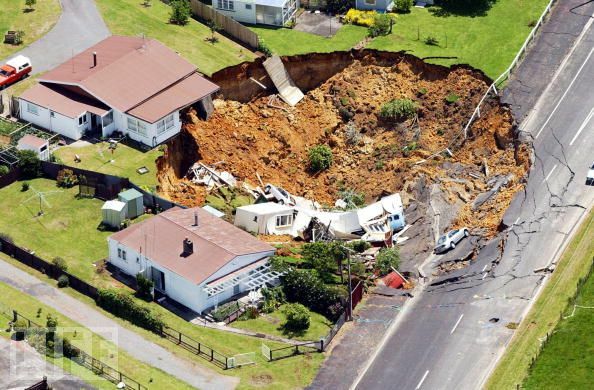 For further background on the tunnellers and their stories, take a look at the following videos available via the New Zealand Tunnelling Company Website. Bluey and Billy return to Komata: Zoe Brown talks about Bluey (John Frederick) Wells and Billie (William Edward) Patterson of Komata, coming home after the war. 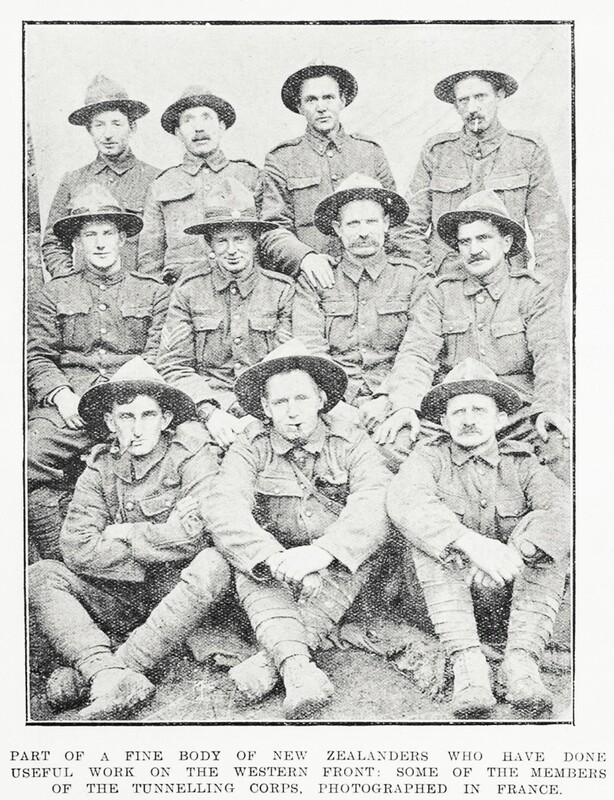 PART OF A FINE BODY OF NEW ZEALANDERS WHO HAVE DONE USEFUL WORK ON THE WESTERN FRONT: SOME OF THE MEMBERS OF THE TUNNELING CORPS. PHOTOGRAPHED IN FRANCE.